Leafs forward Zach Hyman was absent from practice once again on Monday as he's still dealing with a hip pointer injury suffered during Friday's preseason game against the Buffalo Sabres. The 26-year-old had 15 goals and 25 assists over 82 games with the Leafs in 2017-18, his third season with the club. The Leafs battle the Montreal Canadiens from the Scotiabank Arena in Toronto Monday night as preseason action continues. The Panthers returned 2017 first-rounder Owen Tippett to the Mississauga Steelheads of the OHL as one of four roster moves Monday. The team also sent defenceman Riley Stillman and goalie Sam Montembeault to their AHL affiliate, the Springfield Thunderbirds, and released Mark Letestu from his professional tryout. 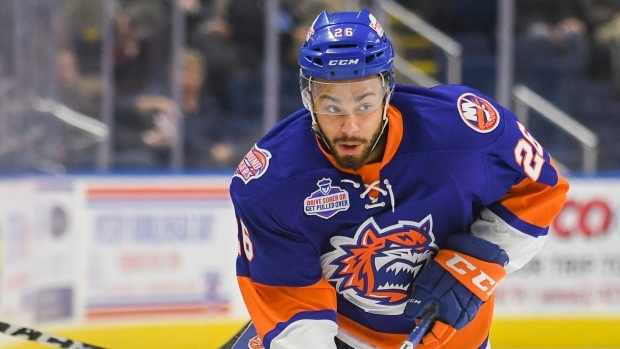 The Islanders made some notable cuts to their training camp roster on Monday, sending forwards Josh Ho-Sang, Michael Dal Colle and Kieffer Bellows to Bridgeport of the American Hockey League. The 22-year-old Ho-Sang has played 43 games with the Islanders over the past two seasons, scoring six goals and 16 assists. General manager Lou Lamoriello told reporters on Monday that Ho-Sang worked hard during training camp, but needed to "get over all these issues that I haven’t seen, that transpired in the past."